A couple people at work are in California, while most of us are here in St. Louis. We did a bit of screen sharing with Google hangouts, but it was laggy and one-sided. Only the host could make changes, and there was a lot of friction involved in switching the host. After looking around for a better solution, I found Martin Brochhaus’ blog post, Pair Programming With Tmux. My setup is the same as his, with the small addition of ngrok. ngrok lets us avoid the trouble of setting up port forwarding for ssh. Create a new user on your computer, called pair or something similar. Authorize your colleagues to ssh into that user’s account. On OS X, turn on Remote Login in the System Preferences. edit your sshd_config to prevent password login. Install tmux and wemux. On OS X, this is just brew install tmux wemux as long as you have homebrew installed. Change pair’s .bashrc to be wemux pair; exit. When the pair user logs in, they will join a wemux session right away, and log out (exit) immediately after leaving it. This keeps folks from doing insidious things on your computer. For example, they might add echo 'say penguin' >> ~/.bashrc to your ~/.bashrc. By keeping them in wemux, you can see everything they’re doing on your computer. This is where the ngrok secret sauce comes in. Up to now, our configuration has been the same as Martin’s. However, we won’t set up port forwarding on our router (maybe you’re at work, or a coffeeshop or an airplane and don’t have access to the router). Instead, we’ll use a ‘Secure tunnel to localhost’ provided by ngrok. You’ll have to download ngrok and put it somewhere on your PATH. Now, run ngrok -proto=tcp 22, which says “Make a TCP tunnel to my local port 22”. Port 22 is where ssh usually runs. You should get a screen like below. You may have to create an account and authenticate your computer in order to use -proto=tcp. Don’t worry — it’s free. I happened to get port 35731. This number will be different every time. 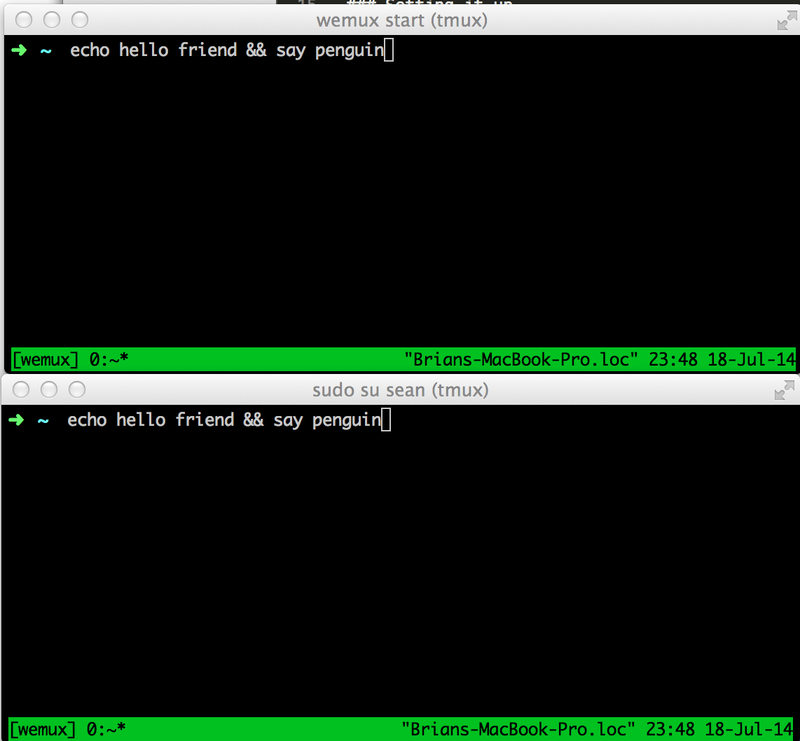 Now, start a wemux session by opening a new terminal window and typing wemux start. Because of what we put in pair’s .bashrc file, the pair user won’t be able to stay logged in without a wemux session running. Give it a try, as soon as you end wemux (by typing exit or Ctrl-D), any users attached over ssh will be immediately logged out. Now that you have wemux and ngrok running, have your colleague log on using ssh -p 35731 [email protected]. The connection will be forwarded from ngrok.com straight to your local computer. © 2013-2019 Brian Schiller. </> available on Github. Powered by Jekyll using the pixyll theme by John Otander.